Vancouver, British Columbia – July 25, 2018 – GGX Gold Corp. (TSX-v: GGX), (OTCQB: GGXXF), (FRA: 3SR2) (the “Company” or “GGX”) is pleased to announce the receipt of the additional analytical results from its diamond drilling program on the Gold Drop property, located near Greenwood, B.C. Drill core analytical results have been received for 2018 drill holes COD18-31 to COD18-33 which tested the COD Vein. The COD gold bearing vein is located in the Gold Drop Southwest Zone. A highlight from these analytical results is an intersection of 8.65 grams per tonne (g/t) gold, 47.6 g/t silver and 37.3 g/t tellurium over 2.98 meter core length in hole COD18-33, including 13.8 g/t gold, 46.2 g/t silver and 47.8 g/t tellurium over 0.90 meter core length. This gold-bearing interval (quartz vein and adjacent altered granodiorite) in hole COD18-33 is located at approximately 50 meter vertical depth and approximately 100 meters southwest of the area of 2017 trenching. COD18-33 is located approximately 170 meters southwest of hole COD17-14 which intersected the 4.59 g/t gold over 16.03 meters, including 10.96 g/t gold over 5.97 meters (News Release of September 7, 2017). The 2018 drilling program to date has been mainly focused on testing and defining the COD Vein, a Dentonia/Jewel style quartz vein. Trenching during 2017 exposed the northeast – southwest striking COD Vein for over 160 meter strike length. The 2018 drilling program has also tested the continuation of the Everest Vein, which is located approximately 600 meters southwest of the COD Vein worksite. The Everest Vein was first discovered by Company prospectors during the 2017. Chip samples collected in 2017 across the approximate 0.4 meter wide vein exposure returned up to 52.8 g/t gold and 377 g/t silver while a grab sample of a quartz vein boulder broken off the outcrop by the excavator returned 81.8 g/t gold and 630 g/t silver (News Release of August 21, 2017). Previous drill core analytical results from the 2018 drilling program are reported in News Releases of May 29, June 14, June 27, July 11 and July 19. The highlight of the 2018 drilling program to date is 14.62 g/t gold, 150.2 g/t silver and 102.0 g/t tellurium over 2.1 meter core length in hole COD18-3 at the COD Vein. 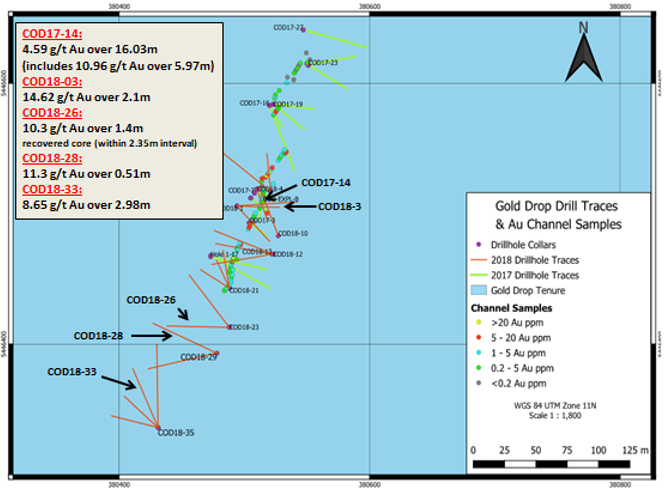 The analytical results listed below are highlights from drill holes DDCOD18-31 to DDCOD18-33 (intersections greater than 1 g/t gold), testing the continuation of the COD Vein south-southwest of the 2017 trench. Since true widths cannot be accurately determined from the information available the core lengths (meters) are reported. The Gold, Silver and Tellurium analyses are reported in grams per tonne (g/t). The interval of 44.09-45.60 meters in COD18-32 is quartz vein / quartz breccia with some silicified granodiorite in the lower part of the section. The interval of 58.52-61.50 meters in COD18-33 is altered granodiorite (58.52-59.93 meters) and quartz vein (59.93-61.50 meters). 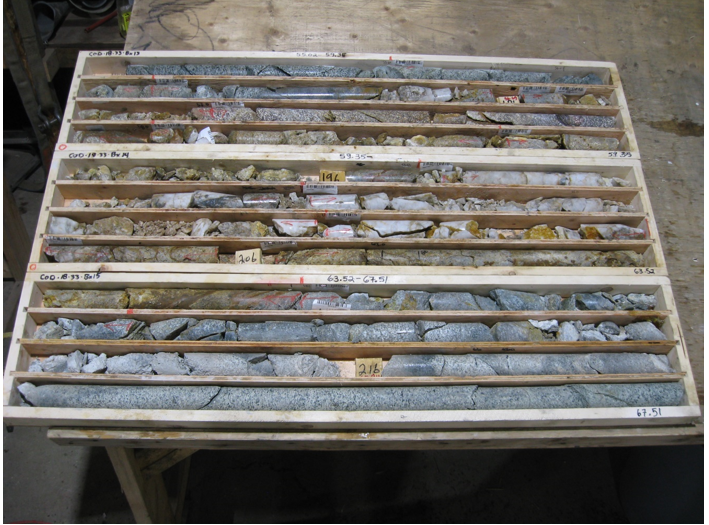 Drill core from the 2018 program was geologically logged and sampled. Drill core was sawn in half with half core samples submitted for analysis and remaining half core stored in a secure location. Core samples were delivered to the ALS Minerals laboratory in Vancouver to be analyzed for gold by Fire Assay – AA. The samples were also analyzed for 48 Elements by Four Acid and ICP-AES / ICP-MS. Quality control (QC) samples were inserted at regular intervals. David Martin, P.Geo., a Qualified Person as defined by NI 43-101, is responsible for the technical information contained in this News Release. To view the Original News release with pictures please go to the website or contact the company. This news release includes certain statements that constitute “forward-looking information” within the meaning of applicable securities law, including without limitation, the Company’s information and statements regarding or inferring the future business, operations, financial performance, prospects, and other plans, intentions, expectations, estimates, and beliefs of the Company. Such statements include statements regarding the completion of the proposed transactions. Forward-looking statements address future events and conditions and are necessarily based upon a number of estimates and assumptions. These statements relate to analyses and other information that are based on forecasts of future results, estimates of amounts not yet determinable and assumptions of management. Any statements that express or involve discussions with respect to predictions, expectations, beliefs, plans, projections, objectives, assumptions or future events or performance (often, but not always, using words or phrases such as “expects” or “does not expect”, “is expected”, “anticipates” or “does not anticipate”, “plans”, “estimates” or “intends”, or stating that certain actions, events or results “may”, “could”, “would”, “might” or “will” be taken, occur or be achieved), and variations of such words, and similar expressions are not statements of historical fact and may be forward-looking statements. Forward-looking statement are necessarily based upon several factors that, if untrue, could cause the actual results, performances or achievements of the Company to be materially different from future results, performances or achievements express or implied by such statements. Such statements and information are based on numerous assumptions regarding present and future business strategies and the environment in which the Company will operate in the future, including the price of gold and other metals, anticipated costs and the ability to achieve goals, and the Company will be able to obtain required licenses and permits. While such estimates and assumptions are considered reasonable by the management of the Company, they are inherently subject to significant business, economic, competitive and regulatory uncertainties and risks including that resource exploration and development is a speculative business; that environmental laws and regulations may become more onerous; that the Company may not be able to raise additional funds when necessary; fluctuating prices of metals; the possibility that future exploration, development or mining results will not be consistent with the Company’s expectations; operating hazards and risks; and competition. There can be no assurance that economic resources will be discovered or developed at the Gold Drop Property. Accordingly, actual results may differ materially from those currently anticipated in such statements. Factors that could cause actual results to differ materially from those in forward looking statements include continued availability of capital and financing and general economic, market or business conditions, the loss of key directors, employees, advisors or consultants, equipment failures, litigation, competition, fees charged by service providers and failure of counterparties to perform their contractual obligations. Investors are cautioned that forward-looking statements are not guarantees of future performance or events and, accordingly are cautioned not to put undue reliance on forward-looking statements due to the inherent uncertainty of such statements. The forward-looking statements included in this news release are made as of the date hereof and the Company disclaims any intention or obligation to update or revise any forward-looking statements, whether as a result of new information, future events or otherwise, except as expressly required by applicable securities legislation. HomeCorporateProjectsTechnical ReportInvestorsNews VideosCompany VideosNews ReleasesContactsLegal ©2019 GGX Gold Corp. All Rights Reserved.